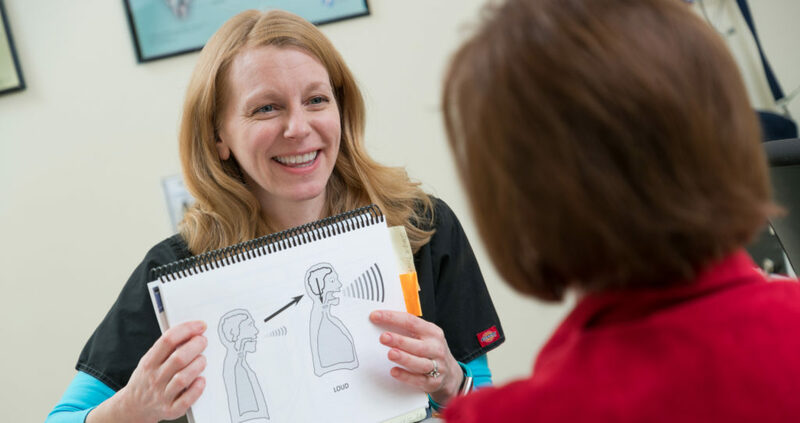 A specialized speech therapy available through Morris Hospital’s Rehabilitation Services helps individuals with Parkinson’s disease talk louder, clearer and with more expression. It all starts with a light tremor in a finger or thumb or even the chin, or perhaps a vague awareness of a diminishing sense of smell. For others, the first sign may be awareness that their own handwriting is getting smaller and smaller. These are all symptoms of Parkinson’s disease, which can vary from one person to another. Symptoms can also include constipation, stiffness in the shoulders and neck, dizziness or the feeling that everyone else must be hard of hearing, when in reality, it’s the person with Parkinson’s whose own voice is becoming softer and harder for others to hear. The symptoms are all part of this chronic, progressive disease that occurs when neurons in a small part of the brain called the substantia nigra begin dying off. It’s still a mystery why the neurons degenerate as they do. And while there is nothing yet that cures Parkinson’s or even slows it down, neurologists like Isaac Mezo, M.D., with Morris Hospital Neurology Specialists say there is a lot that can be done to lessen the symptoms, allowing individuals with the condition to live good quality lives for longer periods of time. Like most medical conditions, the key with Parkinson’s is early detection. Parkinson’s disease is a neurodegenerative condition that affects about one million Americans. While most are males over age 60, women can also develop Parkinson’s, as well as people in their 20s and 30s. Because the brain cells associated with Parkinson’s link directly to other brain cells that play a big role in movement and coordination, it becomes difficult to control the muscles involved in walking, standing upright and even talking when the cells start to die off. The most common medications used to treat Parkinson’s are those that replace dopamine, the chemical messenger used by the cells in the substantia nigra part of the brain to communicate with other brain cells that play a role in movement. When the cells die, so does the dopamine they produce, and that’s when movement is affected. Medications such as L-DOPA and others act as replacements for the lost dopamine. They even cross the blood-brain barrier to go right to the area of the brain that needs it. 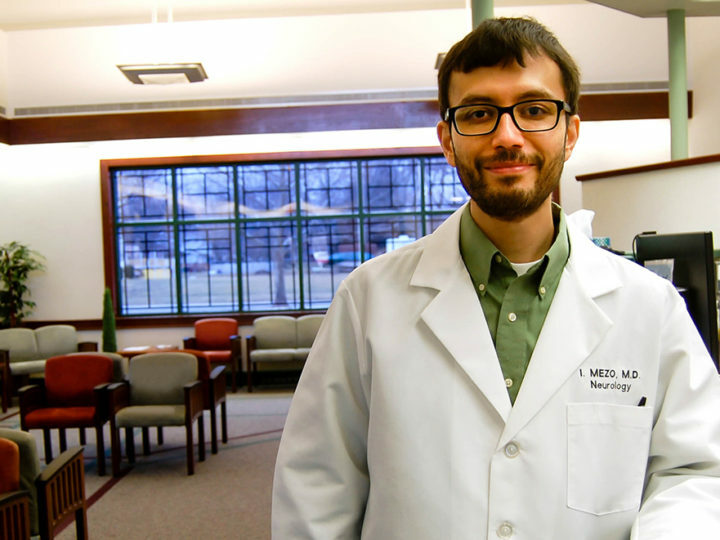 While the medications work quite well, Dr. Mezo says they do cause side effects, which can include depression, low blood pressure, extreme emotional states and hallucinations. As a result, other medicines are often required to treat the side effects. Another Parkinson’s treatment that Dr. Mezo says “works beautifully” is deep brain stimulation. After a specialized neurosurgeon implants the stimulator, Dr. Mezo manages the patient’s condition by programing and adjusting the device in his office. In addition to medications and deep brain stimulation, specialized physical and speech therapies available through Morris Hospital can help lessen certain symptoms associated with Parkinson’s disease. The Lee Silverman Voice Treatment, known as LSVT LOUD, helps with speaking, while LSVT BIG helps with walking and balance. Morris Hospital physical therapist Kristen McPherson is one of several physical and speech therapists at Morris Hospital who holds special certifications in these therapies. She says individuals with Parkinson’s tend to shuffle and have “small” gaits. “It usually takes people with Parkinson’s a long time to get from point A to point B,” she says, “and if they don’t pick up their feet, there is a hazard of tripping. McPherson says when her patients come in for specialized therapy four times a week for four weeks and also do the prescribed exercises on their own, their quality of life is much improved. LSVT LOUD, on the other hand, is a type of specialized speech therapy that helps with speech, facial expression and swallowing. Individuals with Parkinson’s often sound like they are mumbling or develop hoarse, breathy voices. Sometimes they stop talking because they are embarrassed by their voice or frustrated that they may be difficult to understand. Parkinson’s disease is a life-long condition, Dr. Mezo says, and the sooner a person is diagnosed and begins treatment, the easier and more fulfilling their lives will be. For help managing Parkinson’s disease symptoms, call Morris Hospital Neurology Specialists at 815-942-4506 for the Morris office or 815-467-0555 for the Channahon office. For more information on LSVT LOUD and BIG, call Morris Hospital’s Rehabilitation Services at 815-364-8919, ext. 7826 or visit our Rehabilitation Services webpage. A physician’s referral is required for rehabilitation services.